Minnesota lies in the Midwestern United States and meets the Canadian border at the western tip of Lake Superior. With a population of almost five and a half million the state is known as the “Land of 10,000 Lakes.” A large percentage of residents are of Scandinavian and German descent but Minnesota is much more than Vikings and Paul Bunyan. Grand Marais is a lakeside resort town in northern Minnesota. The hotel/motel selection is quite varied from the Best Western on the lake at $169.00 per night and a terribly plain looking offering, to the Mangy Moose Motel right across the street at $100 a night less. Being right across the street, the Moose has just about the same view and has quaintness about it that appeals to me much more than the larger hotel. It is a one story motel with 10 units – the type of place I love. They do not offer wi-fi but I found in short order that the $169.00 Best Western has neglected to password protect their system so I camp on for a free ride all evening. Boneheads! You probably charge your guests extra for this as well. Next morning we head south on the Interstate, destination Harmony. The Interstate conundrum makes for a bit of a predictable drive. You get from point A to point B relatively quickly but you see next to nothing scenic and there is absolutely no identity anywhere. As we circle the metropolis of Minneapolis/St. Paul I notice that the automated highway signs are quite different from what I am used to. In Canada these signs announce such pearls of wisdom as “don’t drink and drive” and “leave more room for big trucks.” Here we see “4 minutes to crosstown bridge” and “10 minutes to river.” Hey, how novel, information that means something. Harmony really is charming, what little we get to see of it late this afternoon. We went to the local grocery store. It is possibly the one and only grocery store in the entire United States that does not sell wine. They directed us to Wheeler’s Bar and Grill advising that they had a large selection of wine and takeout food, which we had also enquired about. As it turns out the wide selection of wine consists of 6 or 8 brands set up on a 20 foot shelf behind the counter. I can’t see closely enough to read the labels so I have to ask. I want a dry red so Bubba offers the following direction, “My buddy Orville comes in here all the time. He likes dry wine and he always buys the California Merlot.” There you have it – if it’s good enough for Orville, it’s good enough for me! Only one thing; the Merlot is $9.49 a bottle. That’s dangerously close to my $10.00 a bottle wine budget so I take the Cabernet for $7.49. Talk about the blind leading the blind! Today is our Amish day which is really why we chose to come to Harmony in the first place. There is just something about their culture that fascinates me from afar. The Amish are a group of Christian church fellowships that form a subgroup of the Mennonite churches. They are typically known for simple living, plain clothing and the reluctance to adopt modern conveniences or technology. Amish church membership begins with baptism, usually around the age of 16. Church districts average between 20 and 40 families and worship every other Sunday in a member’s home. It is a real honour to have your home selected as a place of worship. The children speak their native German and do not begin to learn English until they go to school. The schools are one room houses and the Amish education is finished upon the completion of grade eight. This is all they believe they require to get along in their world. They value rural life, manual labour and humility. All Amish believe that large families are a blessing from God. 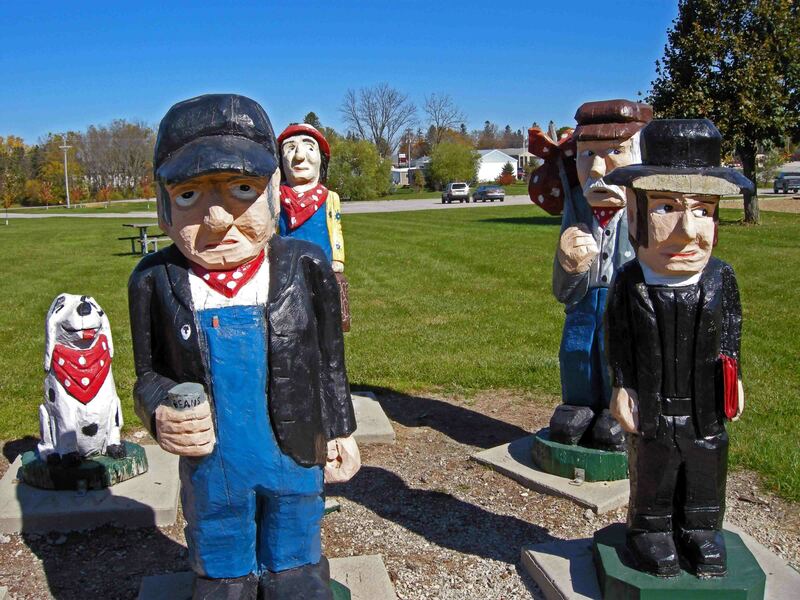 The reason most commonly cited for the Amish not wishing to have their pictures taken is the Second Commandment concerning the making of graven images. Even so there are lots of books and postcards with photos of the Amish selling in community bookstores. It is indeed ironic that a group of people who wish not to be photographed are perhaps the most photographed ethnic group in America. Nevertheless, I made the decision early in the morning that I would try to respect their wishes and refrain from taking pictures of them. Two choices to immerse ourselves in the Amish culture are presented. We can take a guided tour, which is really not our style, or we can rent a CD and take a self-guided, narrated tour. It is $26.00 total and we later found out that the guided tour was $25.00 each. So we win on two counts. 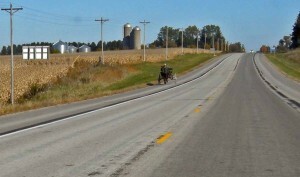 The Amish tend to come in to town from their farms in the early morning and the late afternoon. Just before we left this morning we saw a man in his buggy approaching town. Okay, so much for not taking their picture – I promise I won’t get right in their face about it. I thought it might be difficult to follow the directions but they were simple and the narration was excellent and informative. 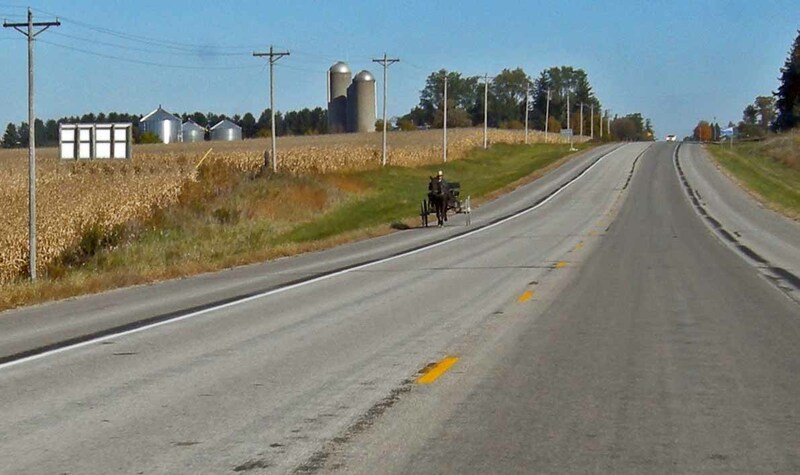 It basically routed us through the backcountry roads to several Amish farms where we were introduced to the owners by name and invited to drive up their lanes to see their wares. According to the CD, it was a search for that perfect Amish treasure. Karen and I knew all along that there would be no “treasure” for us no matter what they had to offer. I really don’t see us buying hand-crafted furniture to cart home with us. 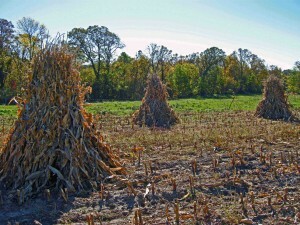 As we approach Henry’s farm I am taken aback by the stunning vista of his corn fields, designed with such symmetry and form it is a piece of art in itself. Upon closer inspection we see that the hay and stalks are tied by hand in stack-like bundles, not baled by any modern machinery. Of all the people we met today, Henry was the most interesting and informative. He explained all about their work ethic, family values, religion and education. He was about the age of my son Gavin so that made him even more interesting to me. He was also quite intrigued about us and where we came from. Offering commentary about the bad Amish (we all have them) he explained that “some of them cause us a lot of trouble.” When I asked if any ever left the community he answered that they did, then added that there were also those that they wished would leave. Henry also mentioned that the Amish people did not like it if anyone chose not to work and make it more difficult for others. I told him that that is one area where our societies differ drastically as in Canada we have welfare and unemployment programs that pay people like that. He was astounded and when you stop and think about it, his outlook makes a lot more sense than ours does. As mentioned earlier, schools and churches are all private so there is no sign of any traditional buildings for either of these two organizations. The preschool children do not yet speak or understand English which accounts for their quizzical stares as we approach them. However, children are children the world over and they respond with plenty of smiles and waves, and that just makes my day. We pull into one farm and are greeted by four preschoolers playing in the front yard. They are all cute as can be, but their clothing sends the whole scenario right to the moon. The two boys are barefoot, in jeans and a shirt and the traditional wide brimmed straw hat. The little girls are in their black dresses, bonnets and heavy work boots. They are busy playing horse with a rope tied around the waist of the lead boy. The Amish children do not have, need or want fancy toys or video games. They entertain themselves with their imagination alone – they may be onto something here. As we pull up it is text book. They stare unsurely at us as we get out of the van, but as we approach, they break into broad smiles and wave. This is a moment I most regret their feelings on taking photographs. You just shouldn’t take them; it’s as simple as that. The people are so reserved and proud, and the kids are all just wonderful and energetic. They really seem happy with their life and you have to admire that. The farms are all peaceful and tranquil and the families are surrounded by chickens, pigs, goats, sheep and cows. It’s so quiet out here – seemingly, a wonderful life. The Amish are very self-sufficient and much of what they make for themselves they offer extra for sale. Baskets, jam, small furniture, quilts, and just about any kind of craft you can imagine. I did come back with one Amish “treasure;” eight chocolate chip cookies. You cannot go wrong with chocolate chip cookies. The tour completed, we enjoy our lunch in the park fighting off a single persistent wasp. There is a couple about our age there as they pull off the bike trail to the railway hobo display we are looking at. They ask us to take their photo then they do the same for us. They, like Henry on the farm, seem to be very interested when they find out we are from Canada. The woman even asks me if I had escaped there during the Vietnam War. Should I be honoured or offended? We take in a movie in a nostalgic theatre built in 1940 and when the movie ends we discover this town seems to roll up the streets and lock the doors by 8PM – even on a Friday night. So, about the only thing open is the Kwiky Mart. Not the best and the selection is poor but where else can you get 2 hot cheeseburgers for under $2.00?